A young girl, almost as soon as she is old enough to walk, goes out to work in the fields with her mother and sibling. It is unrelentingly hot and the work is grindingly monotonous. In tilling and hoeing a small patch of unforgiving land, the family expend more calories than they will ever gain back from any produce they manage to grow. There is nothing left over to sell. A few years later, the two girls are teenagers. A man turns up in a people carrier. He offers them a free ride to Europe. Not ­surprisingly, they go.This happens every day in Edo State in southern Nigeria. The youngsters end up in London or other cities in Europe and the Middle East. Some never make it, thrown out of the vehicles and left to die because they have got ill, or drowned after their boat sank in the Med. The human tragedies engendered by this cycle of poverty and despair have been observed with growing concern for several years by priests and religious sisters in Edo, where 80 per cent of the people are Catholic, and in London, where the church-run Caritas Bakhita House provides a safe space for women escaping human trafficking to begin the recovery process. 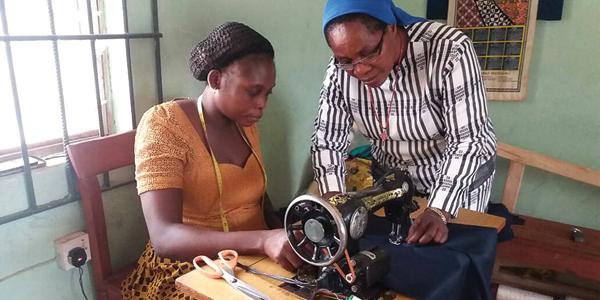 Now, transformationAL work is being done by the Church in both Nigeria and the United Kingdom, working together in a ­creative partnership to develop projects designed to tackle the problem at source. Behind the partnership is the Santa Marta Group, an alliance between the Church and the Police established in April 2014 by Cardinal Vincent Nichols and the Bishops’ Conference of England and Wales to combat human trafficking and modern slavery. In Edo State, the Catholic Church is one of the few parts of civic society that is functioning properly. Nuns have set up weaving businesses; bishops and local churches are overseeing the running of fish and arable farms; priests and laypeople are setting up and managing solar driers; monks are taking on mushroom farming. And they are all training young people, creating sustainable jobs and giving them reasons for staying in Nigeria. A large meeting of the Santa Marta Group, the African Regional Conference, is taking place in Abuja, Nigeria, on 14-15 November. It will embed more firmly the church-led projects that are already chalking up successes in addressing the problem. Bishop Lynch is one of the people behind the GrowEdo project. This has been launched by the Dioceses of Benin, Uromi and Auchi in collaboration with the Santa Marta Group, and trains young men and women from all backgrounds in how to grow crops and manage plots of land. Working beside Bishop Lynch are Fr Mark Odion, a member of the Missionary Society of St Paul, founded in Nigeria in 1977, the project coordinator; a London-based lawyer, Eamonn Doran; and an agricultural expert, Richard Byrne. One of their first meetings was in Peterborough about five years ago, Bishop Lynch told me. “A young Eastern European police officer told us that gangs were going to his country and recruiting people by making them all sorts of promises. They bring them over in coaches and then take their passports as soon as they have come through the tunnel.” It was, he told me, “a red flag”. On the other side of the problem is Africa. According to some estimates, more than 60 per cent of the Nigerian women found in ­prostitution in Western Europe come from one part of Nigeria: Edo State. Fr Odion is one of the key people bringing things together in Edo. He discovers who are the key agents and organisations and what partnerships will be needed to get a greater awareness of the problem and the solutions. GrowEdo is a pilot project. The hope is that in time it will be rolled out to other parts of the Church in Africa. The forthcoming conference in Abuja will explore how the whole African Church can be helped to replicate what is being done in Edo State. Fr Odion describes going to Mass at the cathedral in Uromi, where the problem is at its worst. “On the way, you will pass a garage. A people carrier comes there two to three times a week. It takes young people on their journey north. Then they go north-east to Libya.” Young boys and girls starved of income and livelihood must find a way to survive. “Either they engage in robbery or they choose to leave the country,” he says. “Ninety per cent choose to leave. But they get into the wrong hands.” Fr Odion grew up in Uromi, and knows its problems at first hand. Fifteen young men and women have begun a one-year programme in “agri-preneurship”, including learning basic farming skills, new techniques, and how to use social media to market the goods produced. In Benin and Uromi Dioceses, mushroom-growing is being explored in partnership with a traditional medicine company, Paxherbals, run by a Benedictine monastery. In addition, the Sisters of the Sacred Heart of Jesus have been commissioned by the Archbishop of Benin, with some funding from Santa Marta to run a five-year campaign to reach 500,000 young people in schools, towns and villages, educating them about the perils of trafficking in the hope they can be persuaded to remain in the state while the new agribusinesses develop. The work exemplifies the “Three Ps” of the Santa Marta Group – Preventing, Protecting, Partnership. The importance of the latter ­cannot be overstated. Nothing can be done without the backing of the local chiefs, the archbishop and bishops, and they have all thrown their support behind the project. The Santa Marta Group has provided the sisters with a laptop and projector, a car, an electricity generator, and a five-year allowance for a driver. The marketplace is where the ­community comes together: the sisters go there and talk to as many of the youngsters as they can, as well as visiting schools, hospitals and other places. They warn constantly about the risks of being trafficked, and have been so effective that some traffickers have already left the area. But the Church wants the ­traffickers stopped altogether. Hence the new agribusinesses, to give young people a real incentive to stay. Ruth Gledhill is The Tablet’s multimedia editor. She will be reporting on the Santa Marta Group’s conference in Abuja.